In the world of skin care, there are a few names that are synonymous with the words "Classic" and "Timeless". You may think of product lines such as Estee Lauder or Chanel when you think of those words and skincare combined. One name that you may or may not be familiar with is Pevonia. Pevonia has been a premier company in the world of skin care and were the first company to develop a Spa Skincare Line exclusively for elite spas and Professional Aestheticians (Estheticians for us US folk!) Pevonia's first skin care products launched in 1991 by combining effective, natural and safe skincare ingredients with decades of skincare knowledge and experience. This Holiday Season, Pevonia and beautystoredepot.com have teamed up to provide our customers with an exclusive by providing a deluxe sample of their Lumafirm Body Moisturizer Firm and Glow to try-on and indulge your skin with this powerhouse treatment. 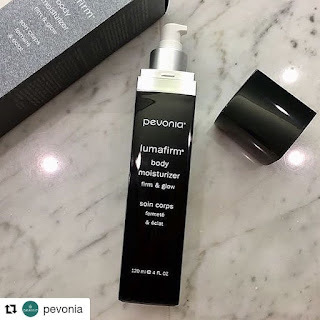 Pevonia's Lumafirm Firm & Glow quickly firms, smooths and brightens tired, stressed skin. With a creamy consistency, skin will feel invigorated with hydration. Additionally, Lumafirm Body Moisturizer can counteract hyperpigmentation! Sounds ideal right? In addition to the Lumafirm, beautystoredepot customers will also have the opportunity to try Pevonia's Award Winning Myoxy CaviarTimeless Balm Cleanser. The Timeless Balm Cleanser is an anti-aging, sulfate-free, foaming cleanser for dry, mature skin with lines, wrinkles and loose, sagging skin. This cleanser also removes makeup and debris to refresh, hydrate and repair without drying aging skin. Pevonia's Myoxy Caviar products are formulated with up to 19 vitamins and contain iron, magnesium and phosphorus which are needed by cells to utilize oxygen more efficiently and to improve cellular metabolism. It also improves mitochondrial ATP which restores and recharges cells to function at a higher capacity. It contains phospholipids that are nourishing and restoring for the cellular membrane. Pretty brilliant! Create and improve your timeless classic beauty and prevent your skin from showing all of the tell-tale signs of aging with the help of these 2 incredible Pevonia products. So, "How can I try these awesome Pevonia products?" you might say. Beginning Black Friday (yes, the day after Turkey Day), on orders $125 and up you have the opportunity to qualify for beautystoredepot.com's exclusive (and Famous 😉) Black Friday Swag Bags containing some of beautystoredepot.com's most amazing and most loved products. Be sure to keep an eye out on our website, and social media for our exclusive Black Friday sales and swag bags and be sure to take advantage of our exclusive savings! Questions? Please contact our customer service department at 1-800-926-5219 or by live chat !